Buffet Bounty: Some of the options in Sneha's all-you-can-eat lunch. FOR INDIAN-FOOD LOVERS with big appetites and small budgets, Sneha spells solution. This eatery--soon to be an institution--packs plenty of spices and choices for pocket change at its quietly famous buffet. Lunch ($6.99) and dinner ($7.99) offer bounties of mild southern Indian and spicy northern Indian favorites. One winning point: This is no dive. The dining room stretches banquetlike on green carpeting under pleasant chandelier illumination softened with hedges of indoor plants and smoked windows. Hindi music coos in the background as a battalion of very serious but attentive waiters sweeps through the room to ensure that everything is running smoothly. Unlike most buffet palaces, Sneha offers a sedate experience where the staff doesn't appear harried and the patrons don't waste mountains of food. As for the chow, some 30 items grace a fairly long bank of steam tables. Nowhere near as colossal as most all-you-can-eat joints, this spread boasts one distinguishing feature: quality. While delicacies such as beef nirha, prawns pasanda and tandoori quail won't get billing here, tandoori chicken and rogan josh hold down the fort fairly well. Bonuses include Indian staple dishes--such as idly (steamed spongy rice cake) and yogurt rice balls--that rarely surface on most Indian restaurant menus. We started the feast with a salad and cucumber raita. The fabulously sour yogurt sauce, chunky with diced cucumber, was fitting with iceberg lettuce and sliced tomatoes. As expected, the deep-fried morsels sentenced to the steam table turned out to be greasy and unappetizing. For instance, spinach pakura (battered and fried) didn't warrant a second bite--especially with the overly salty mint chutney. On a tastier note, we particularly enjoyed the refreshing citrus-flavored rasam soup, a vegetable stock steeped in tamarind and whole roasted chile peppers. Armed with nan (flatbread), we grazed a vegetarian section crowded with seven choices. The palak paneer, a stew of spinach, goat cheese and nuts, satined our nan with good color and freshness. Chana masala--creamy garbanzo bean curry--was as fragrant and toothsome as any found in local restaurants. Although the basmati wasn't top grade (premium basmati is expensive), the tamarind- and saffron-laced rice gave new life to this played-out starch. Minor vagaries such as bruised fruits tainted an otherwise honorable herbivore cove. On the meaty side, the rogan josh (creamy lamb curry) surpassed the chicken masala (red yogurt chicken curry) in tenderness. The latter was either old or overcooked. 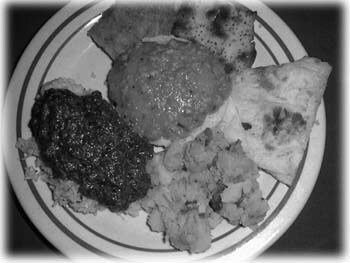 Both sauces, however, hummed with such an abundance of ground spices that they were practically grainy between the teeth. Because it draws a large Indian-American crowd, the kitchen isn't bashful with spices, so the meat dishes came across pretty fiery. Good thing every table got a whole pitcher of ice water. As we polished off the meal with mango-infused ice cream, we admired the owners' attention to details. Thumbs up to Sneha for a splendid buffet--a real classy bargain. Sneha is located at 1214 Apollo Way, Suite 404 (off Lawrence Expressway), Sunnyvale (408/736-2720). Send Bargain Bite tips to [email protected] or call 408/298-8000, ext. 441.